Huatulco is known for its stunningly beautiful bays, but the region is also steeped in history and folklore. In fact, this is the stuff that epic movies are made of. Several places bear the name Santa Cruz, but the beach in Huatulco is the original one! For anyone unfamiliar with Spanish, the name translates to “Holy Cross”, but it does not refer to the Christian Son of God. Legend has it that long before the Spaniards arrived in the New World, a man with a flowing white beard floated on a cross onto this beach. The natives believed he was Quetzalcoatl, the ancient Winged Serpent God, who had promised to return to his people. No one knows what happened to the man, but the cross was erected on the beach in Santa Cruz. 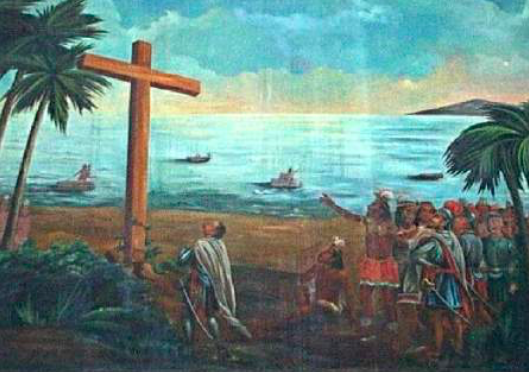 It is documented that pilgrims came from as far away as Peru to worship at this cross and to seek favors. The name “Huatulco” is an indigenous word meaning “The place where wood is worshipped.” When the conquistadors arrived, the people were already worshiping the symbol of a cross, paving the way to their Catholic conversion. The sheltered bay of Santa Cruz made a perfect port, so that goods such as spices, silk, gold, pearls, and precious gems were shipped here from Asia and South America. Purple dye, which was worth a hundred times its weight in gold, was harvested nearby from local sea snails and prepared here for transport. As the narrowest point in the new world, this was an obvious place for porters to carry goods over the mountains to Veracruz. From there they were shipped on to Spain. As time went on, Huatulco became a major commercial center for shipping and trade, putting the town in peril of attack by pirates. When the pirates raided, the natives helped the Spaniards drive them off; in retribution, the pirates sacked the town, burning it to the ground. The only thing left standing was the cross on the beach, which added to its legendary magical properties. Due to continuing pirate attacks, the townspeople petitioned to move the location inland and this is how Santa Maria Huatulco was founded. At this point, the story begins to resemble The Sword in the Stone, but the legend continues that the embittered pirates returned and tried unsuccessfully to chop the cross down with an axe. As the mystical powers of the cross increased, so did the numbers of pilgrims who came to worship. Some would slice tiny slivers from the cross as relics to take home. Although the tomb of St. Thomas rests in Madras, India, the Catholic priests insisted that St. Thomas traveled here, spreading the word of “the one true faith”. As the vehicle of St. Thomas, the cross became a sacred Christian relic and the priests were able to accomplish what the pirates could not. Fearing for its stability, the priests had the cross dismantled; a small piece of it is buried in the church in Santa María Huatulco, another in the cathedral of Santo Domingo in Oaxaca City, but the lion’s share is housed somewhere in the bowels of the Vatican archives in Rome. You may be familiar with the pirates responsible for attacking Huatulco. Their names were Francis Drake and Thomas Cavendish. Hero or villain … it really depends on which side you are on.